He played with Ruth and Gehrig, and managed Snider, Mays, Banks, Santo and others. Leo Durocher was just a solid infielder, but largely considered one of the best managers in baseball history. The Veterans Committee saw fit to add him to the Hall of Fame in 1989. 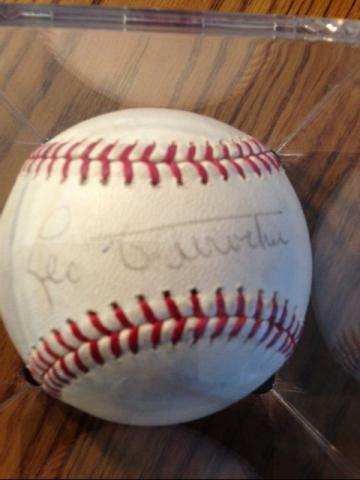 This baseball is signed on the Sweet Spot by Durocher, personalized on the side to "Barney," but still considered a fairly rare find. Fans and game historians will create strong demand for this baseball. Buy it now for your collection. 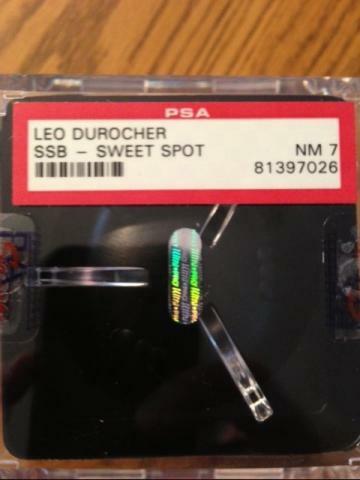 Authentication provided by PSA/DNA. Due to the unique nature of this ball we will charge your credit card for the full amount immediately upon taking your order. This policy ensures we reserve the ball for you. We will confirm your order by Email. This ball is not game used. Please allow at least 2 weeks for delivery. 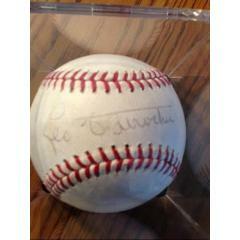 Leo Durocher Autographed Baseball $595.00 Sold Out!